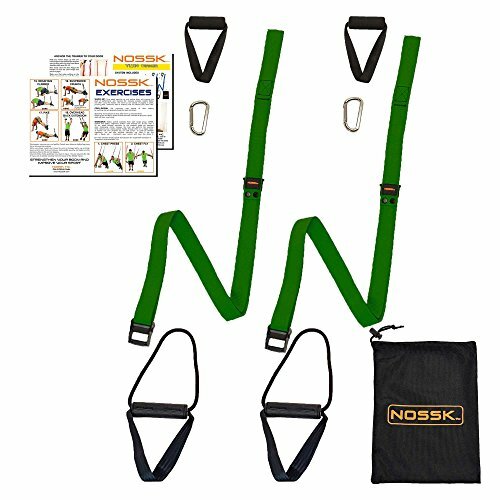 This NOSSK TWIN PRO Suspension Fitness Strap Body Weight Trainer is made of many US components such as US made Rope and US made 1st Grade Military webbing. Train for a Spartan Race or for Cross Fit or simply make your own Home Gym with this NOSSK TWIN PRO Suspension Strap System. No need for an Ab Roller or Free Weights or workout machine. Two separate Straps allow a narrow or wide Strap set-up - perfect for dips etc. For One-Arm Exercises simply grab one Grip - No need to turn the Trainer into Single Handle Mode. The height of the Grips are easily adjusted with the 2 Cam Buckles - no need to open and close the door to re-set the height of the grips as is needed with some other systems. Get started today. 1 YEAR NO HASSLE WARRANTY! We are sure you'll love it, if not return it no questions asked. 100% SATISFACTION GUARANTEE from NOSSK, Inc. - a California, USA company. FOR BEGINNER to EXPERT. 100% SATISFACTION GUARANTEE from NOSSK, Inc. - a California, USA company - 1 YEAR NO HASSLE WARRANTY! If you have any questions about this product by NOSSK, contact us by completing and submitting the form below. If you are looking for a specif part number, please include it with your message.